We offer state of the art, in office, dry eye treatment utilizing the latest technology in a spa like experience. The MiBoFlo Thermoflo® is a therapeutic device providing an alternative therapy for dry eyes. It uses a proprietary thermoelectric heat pump to help maximize liquefaction of meibum, thus improving the preservation and function of the evaporative component of the tear film. This therapy is aimed at improving function of the meibomian component of the tear film. The thermo control operates within a plus or minus 3% variance to maintain an effective treatment temperature of 108 degrees. 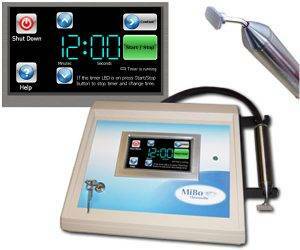 The MiBoFlo has an adjustable timer allowing for the versatility to treat various levels of dry eye. Vision Source Mesquite was one of the first private practices in Texas to treat patients with the MiBoFlo.